Is your hydraulic fluid milky or cloudy? Are your components failing and filter elements clogging? Advanced Fluid Systems now offers four different filtration systems for rent. 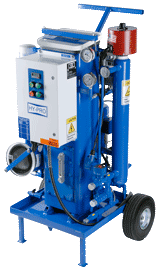 The Hy-Pro FCL portable filter cart is ideal for removing particulates while transferring fluid or cleaning you fluid in the reservoir similar to a kidney loop. 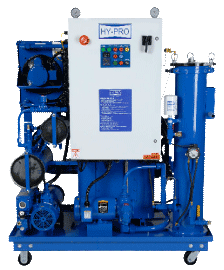 The V1, V10 and V20 Hy-Pro VAC-U-DRY dehydrator is an economical and safe way to remove free and dissolved water, gases and particulate from your hydraulic fluid, thus extending the life of your fluid and reducing component costs and downtime. Worry-Free Operation: Dual condensate water tanks with automatic drain standard for 24 x 7 unattended operation. Easy Setup: Automatic electric phase reversal; programmable thermostat; and smart relays with controlled start-up and shutdown routines. Free Support: On-site setup and start-up support is included free of charge on rentals in the Mid-Atlantic and New England regions. Reservoir Volume (1): Up to 1000 Gal. Reservoir Volume (1): 100 to 4000 Gal. Reservoir Volume (1): 100 to 6000 Gal. (1) Reservoir volume is recommended for timely cleaning. (2) The Hy-Pro V1 Vac-U-Dry is not recommended for larger fluid volumes that are less than 140 degrees Fahrenheit. (3) Micron sizes are based on a Beta ratio of 200. Beta ratio 1000 values are available. (4) An Advanced Fluid Systems’ representative will contact you regarding your fluid type, viscosity and operating conditions. Can the VAC-U-DRY (“V”) units be used on lubrication fluids? Yes. 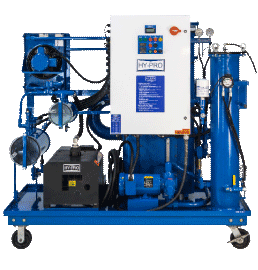 Hy-Pro vacuum dehydrators are effective with most non-water based hydraulic, lubrication and transformer fluids. We will verify that your fluid type and viscosity is suitable prior to your rental. Can I use the filtration system on multiple systems during the rental period? Yes. All of our filtration rentals are mounted on wheels for portability. If you are filtering different oil types, all of the elements must be replaced. How is the rental period calculated? The rental period begins the day after the unit leaves our facility and ends the day we receive it back. Can I purchase my rental unit? Most rental units are available for purchase at a significant discount. Ask us for additional information. For additional Hy-Pro VAC-U-DRY rental information, including pricing and terms, please fill out the request form below or contact us at 1-800-220-1013. Please provide as much information as possible regarding your application and fluid. We look forward to hearing from you.